Sunglasses with polarising lenses remove reflected glare from all surfaces, including water. This allows anglers to see more clearly into the water and locate individual fish. Polaroiding is the popular angling term for finding fish with the use of sunglasses with polarised lenses. By removing the reflected glare from the water’s surface it allows the angler to see more clearly into the water and to locate individual fish with added accuracy. Polarising sunglasses are best suited to the shallow waters of lakes and streams. They are at their most effective for spotting fish between 10 am and 4 pm, when the sun is highest. Large brimmed hats or long peaked caps, and the addition of side shields, improve their effectiveness. Polarising lenses were patented by Edwin Land in 1929. They were first used by American pilots from 1936, and first sold to the public in 1937. These first polarising glasses were made in the US by Bausch and Lomb, under licence from the Polaroid Corporation and were called Ray-Ban. The effect was truly remarkable. There was a blank sunny ripple: on with the polaroids and there they were like a mob of sheep! Polarising glasses became widely available after the War. By 1947 sports stores and pharmacies across Australia, such as Abra’s Pharmacy in Launceston, offered them for 30 shillings ($3). David Scholes wrote about their use in fly fishing in the early 1960s. However, they were not commonly used by anglers until the 1970s. By the early 1980s, they had become an essential items in the angler’s kit. 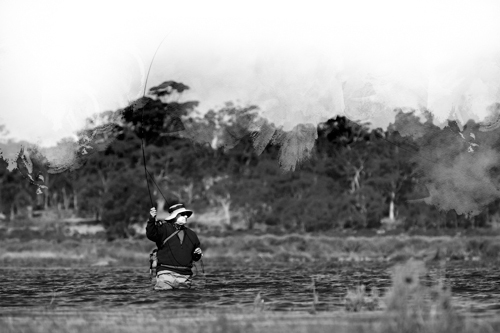 Lake fishing revolves around polaroiding, the most important aspect of stillwater fly fishing. Polaroids provide an unbelievable advantage to the stillwater fly fisher…Many anglers simply flog the water without sighting a fish. They search blindly, just ‘casting and hoping’ instead of covering the water by quartering the casting area, moving on and quartering again. ‘Polaroiding’ is less common in other parts of the world.